Peace and quiet: Makadi Bay 2019 offers some of the quieter holidays on the Egypt Red Sea Riviera. That’s not to say there’s not much to do here, just that the nightlife takes a back-seat to the more relaxing holiday activities on the beach or the golf course! Great dives: As with many other Egyptian holidays, the dive sites around Mikadi Bay are beautiful and enchanting. 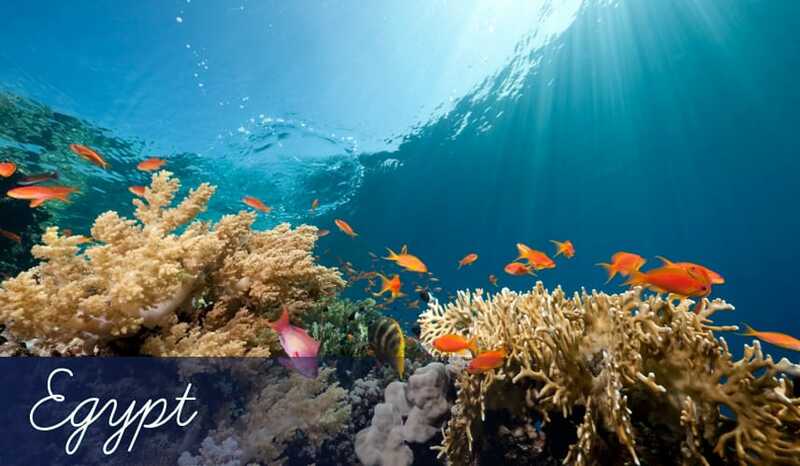 It’s largely because the warmth of the Red Sea allows corals and tropical fish to thrive, while its clarity ensures you’ll be able to see it in its full splendour (and take some amazing underwater photos too!). Diving & Snorkelling: Makadi Bay is another of those Egyptian resorts which lends itself well to diving holidays. It’s also close enough to Hurghada and Giftun Island to take advantage of the spectacular dives around those areas too. The main dive sites actually close by Makadi Bay include Gota Abu Ramada which has interspersing coral reefs and a variety of aquatic life. The gentle current also makes it an ideal site for beginners. Ras Abu Soma is one for the more experienced diver, as the sharp drop leads to depths over 30m, and the extra space attracts larger fish such barracuda, reef sharks and giant moray eels. Water sports: Along with the dive centres, Makadi Bay also offers equipment and lessons for a variety of (mainly wind-based) water sports. Kite-surfing is a new and emerging water sport which you should definitely give a go if you’re feeling adventurous. If not, you can always stick to good old windsurfing, which is very popular on holidays to the Red Sea in general. Madinat Makadi: This magnificent 18-hole course was designed with great golfing holidays in mind. The intensely green, trimmed fairways are in fantastic condition, and create a unique contrast to the backdrop of the golden Saharan sand. Clipped palm trees and many water features also add to the intrigue of this classy course. Makadi Bay hotel beaches: Makadi Bay is a fairly small resort, largely consisting of a protected cove of coastline. The sands here are of the cotton-soft pure white variety, which makes a change from the golden colour typical of beaches in Egypt. Most of the beaches are actually privately owned, with each all inclusive hotel dotted along the coast laying claim to its particular sandy stretch. That’s not an issue though, as there are still several beaches open to everyone, and it’s highly likely you’ll have a private beach to enjoy anyway if you have all inclusive holidays here. Caravan Bazaar: This beachside restaurant serves an interesting mix of international food and traditional Egyptian cuisine. And as you’d expect from a beach based restaurant, the seafood is very fresh too. La Trattoria: An authentic Italian restaurant located on the coast of Makadi Bay. You’ll enjoy beautiful views of the Red Sea while eating classic dishes like lasagne, ravioli and pizza. Aladdin: This restaurant serves all kinds of home comfort food like pie and chips or just a juicy, fresh burger! It’s a relaxed place to enjoy informal dining with an ice cold beer. Quiet drinks: Despite having a low-key approach to nightlife, Makadi Bay holidays still present you with a few options for having a great evening out. Many of the bars and clubs are based around Souk Makadi – a large centre which has lots of different shops as well as nightspots. Boiler Disco is the best club to go to, and you may even get to hear some international DJs playing there. And Sunset Bar certainly lives up to its name, as this beachside bar offers amazing views of the amber sun slowly setting into the shimmering Red Sea. Souk Makadi: This vibrant shopping centre has over 145 outlets selling all sorts of different items. Shops in Egypt like to pile their stock high so it’s not uncommon to see Sheesha pipes and papyrus sitting alongside gold jewellery and oil perfumes. It’s truly a feast for your eyes to see all the sights and sounds of the vibrant shops. As well as picking up souvenirs on your holidays in Makadi Bay, there are more practical shops like a pharmacy, a supermarket and a beachwear shop.